JOSPER S.A. was founded over 40 years ago; our main aim has always been to provide the highest standard of service to professionals in the sector, constantly improving and perfecting the manufacture of our products. More than 7500 customers is our guarantee of quality. Products: A JOSPER charcoal oven is a barbeque oven manufactured using traditional methods and the highest quality materials, aimed at the extremely demanding and professional hotel and catering sector (hotels, restaurants, bars, etc). The Josper oven is a closed barbeque oven, operated by a system of adjustable draughts. Thanks to this operating system the oven has a number of advantages: greater heat control; savings on charcoal (the oven pays for itself in a year and a half); faster cooking speeds than traditional barbeques; dual function oven and grill; considerable reduction in flame (which can smoke, burn and dry out food). When cooking with a Josper oven, you can be sure of amazing results. You can grill any sort of food: from chops to filets of fish, from seafood to succulent roasts. Grilling vegetables is easy (leaving them moist and delicious-looking) as is making pizzas (with an authentic wood flavour) and homemade desserts. 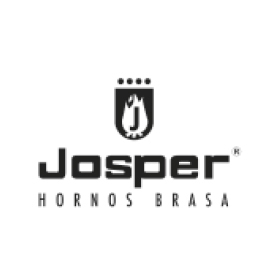 JOSPER supplies JOSPER/LUMIX solid alcohol lighter bricks for lighting barbeques and fires to the whole of Spain. These bricks do not produce smoke, odours or toxic materials. We also supply various types of VEGETABLE CHARCOAL under the Josper brand name. These come in a practical cardboard box packaging system especially for the catering industry, which makes handling easy and serves as a dispenser. The boxes are also easy to store.